RALEIGH, N.C. — Aaron C. Clark ’97 EDD will be the head of the NC State College of Education’s Department of Science, Technology, Engineering and Mathematics (STEM) Education, effective Aug. 1. He is a professor of technology, design and engineering education and currently the Department of STEM Education’s director of graduate programs and associate department head. As the head of the Department of STEM Education, Clark will oversee a department that is home to more than 20 full-time faculty members and 407 undergraduate and graduate students. They conduct research and study across programs in Mathematics and Statistics Education; Science Education; and Technology, Design and Engineering Education. The department is North Carolina’s largest producer of STEM educators and its faculty rank among the most productive STEM education researchers in the nation. “I look forward to working with our excellent faculty and students as we continue the growth and development of STEM education and outreach in North Carolina and beyond,” Clark said. director of graduate programs since 2008.
educator and scholar. The International Technology Engineering Education Association also has recognized him as a Distinguished Technology Educator. His teaching specialties are in visual theory, 3-D modeling, technical animation, and STEM-based pedagogy; and his research focuses on graphics education, visual literacy, scientific/technical visualization and professional development for technology and engineering education K-12. fields, particularly for female students, underrepresented minorities, first-generation college students and at-risk students. Before entering academia, Clark worked in industry and as a consultant in graphics related areas. 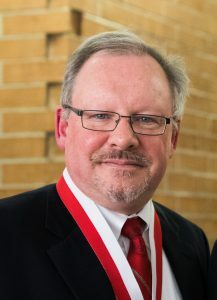 He went on to teach drafting and computer-aided design technology at Chesapeake College in Wye Mill, Maryland, and eventually became chair of head of the college’s Division of Science and Technology before pursuing his Doctor of Education in technology education at the NC State College of Education. He received his bachelor’s in industrial arts/technology education and master’s in technology from East Tennessee State University. Clark will succeed Kathy C. Trundle, who left NC State June 6. Lee V. Stiff, associate dean for faculty and academic affairs, will assume responsibility for STEM Education department matters until Clark’s appointment begins Aug. 1.